Sign hire contact and vehicle condition report form. You shall pay for any overconsumption (extension, mileage overrun, if not included in the fare option chosen by you, petrol, possible expenses for repairs or excess damage/loss, ...). 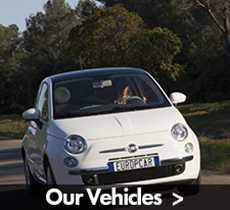 You will enjoy the Europcar assistance 7 days a week (in case of breakdown or accident) by contacting your Europcar closest car hire station (to find the address, check the list located in the car’s folder). You shall pay for any overconsumption (extension, mileage overrun, if not included in the fare option chosen by you, petrol, possible expenses for repairs or excess damage/loss...).